JEREMY BLACK — The British and the Grand Tour. ROBERT BOTHWELL — Eldorado: Canada's National Uranium Company, 1926-1960 | DUNCAN MCDOWALL — Steel at the Sault: Francis H. Clerque. Sir James Dunn, and the Algoma Steel Corporation, 1901-1956. JUDITH F. STONE — The Search for Social Peace. Reform Legislation in France, 1890-1914. HERBERT J. BIX — Peasant Protest in Japan, 1590-1884. | WILLIAM W. KELLY, — Deference and Defiance in Nineteenth-Century Japan. PAUL WEINDLING, ed. — The Social History of Occupational Health. ROBERT M. COVER — Justice Accused, Antislavery and the Judicial Process. JACQUES ROUILLARD. — Ah Les Etats! Les travailleurs canadiens-français dans l'industrie textile de la Nouvelle-Angleterre d'après le témoignage des derniers migrants. 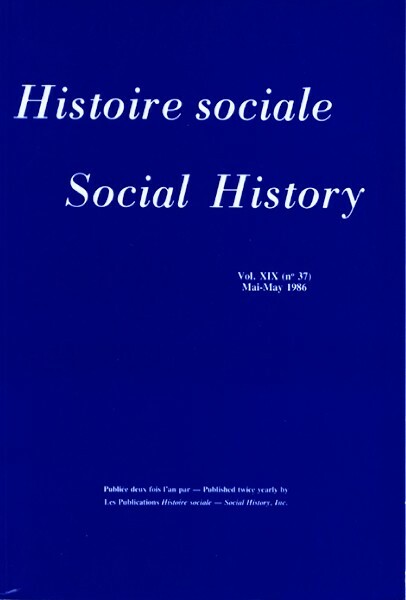 JEAN HAMELIN, NICOLE GAGNON — Histoire du catholicisme québécois III: le XXe siècle, tome I, 1898-1940. PETER CLARK, ed. — The Transformation of English Provincial Towns 1600-1800. | JAN DE VRIES — European Urbanization 1500-1800. J. DONALD WILSON, ed. — An Imperfect Past: Education and Society in Canadian History. ANNE-LOUISE SHAPIRO — Housing the Poor of Paris, 1850-1902. W.R. LAMBERT — Drink and Society in Victorian Wales, c. 1820-1895. FRED ANDERSON — A People's Army: Massachusetts Soldiers and Society in the Seven Years War. ROLF PETER SIEFERLE — Fortschritts-Feinde? Opposition Gegen Technik und Industrie von der Romantik bis zur Gegenwart. LUCA CODIGNOLA — Vatican : Archives de la Sacrée Congrégation de la Propagande. DIANE PAYMENT — Batoche (1870-1910). PHILIP D. CURTIN — Cross-Cultural Trade in World History. RAMSAY COOK — The Regenerators: Social Criticism in Late Victorian English Canada. JOHN ROBERT MCNEILL — Atlantic Empires of France and Spain: Louisbourg and Havana, 1700-1763. T. W. ACHESON — Saint John: The Making of a Colonial Urban Community. ANDREW CHARLESWORTH, ed. — An Atlas of Rural Protest in Britain: 1548-1900. D.J. HAu..- Clifford Sifton Vol. 2: A Lonely Eminence 1901-1929. C. HARDING, B. HINES, R. IRELAND and P. RAWLINGS — Imprisonment in England and Wales: A Concise History. MARTIN MCCAULEY — Octobrists to Bolsheviks. Imperial Russia 1905-1917. REX A. WADE — Red Guards and Worker's Militias in the Russian Revolution. B. ANNE WOOD — Idealism Transformed: The Making of a Progressive Educator. EMILIA CHICOINE, C.N.D. — La métairie de Marguerite Bourgeoys à la Pointe-Saint-Charles. MICHAEL GROSSBERG — Governing the Hearth: Law and the Family in Nineteenth-Century America. J.M. BEATTIE — Crime and the Courts in England, 1660-1800. YVONNE YAZBECK HADDAD and ELLISON BANKS FINDLY, eds. — Women, Religion and Social Change. MATIHEW EDEL, ELLIOT D. SCLAR, and DANIEL LURIA — Shaky Palaces: Homeownership and Social Mobility in Boston's Suburbanization.